Khurasan Miniatures präsentieren ihre Neuheiten auf Facebook. The Low Countries infantrymen are in eight poses, all protected to differing extents, half with leg armour as well. They have separate shields enough for all eight — half are depicted in the image without to show how they look. The booster set is the same, but it adds eight of the nightmarish Plancon spiked clubs that dealt such death to the French knights at Courtrai in 1302. The plancon can be added instead of the spear, and you can also stick the plancon on so that it’s wielded two-handed. 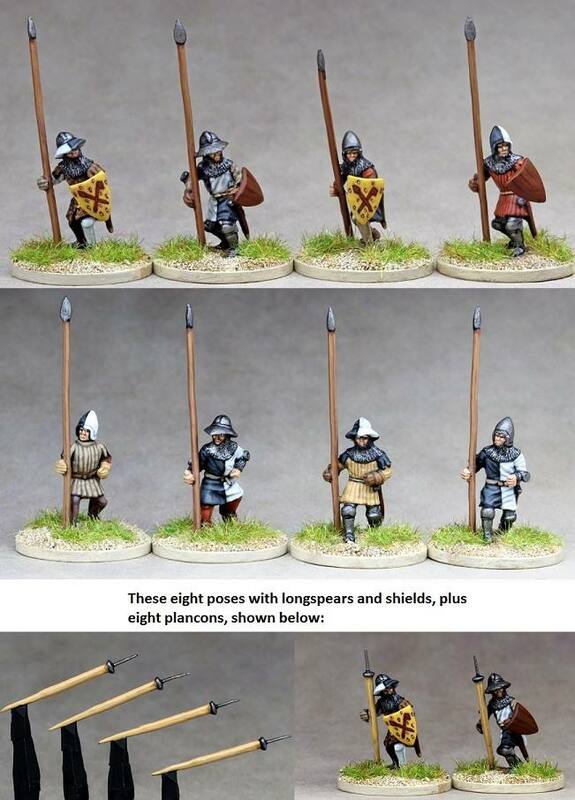 I would recommend using a mix of German and French crossbowmen for the Low Countries, and a mix of Western and (mostly) German knights for the cavalry. The Teutonic sets have the men in surcoats. These were feared adversaries, the spearmen being very well protected, some even wearing visored bascinets. (The spearmen are depicted in white surcoats but seem to have got a special dispensation from the Brethren to do so, as wearing white was forbidden in the ordenstaat as a symbol of paganism — except for the Brethren of course!) These would have commonly worn grey and had the Tau cross as a symbol, which looked like a T instead of a complete cross.